A revolutionary new DNA tool could help take humanity a step closer to eternal life. The device (pictured) pioneers a new technique that makes it cheaper and easier to synthesise genes ‘overnight’, say scientists — a process that normally takes several days. 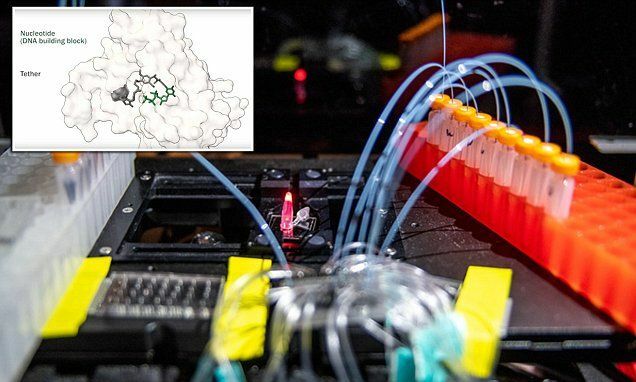 Scientists at the University of California at Berkeley said it could lead to ‘DNA printers’ in research labs that work like the 3D printers in many modern workshops. ‘If you’re a mechanical engineer, it’s really nice to have a 3D printer in your shop that can print out a part overnight so you can test it the next morning,’ said UC Berkeley graduate student Dan Arlow.